Within a few months of seizing power, Hitler had destroyed the fundamental legal principles of the Weimar Constitution. By invalidating basic civil rights, abolishing the separation of powers, and routinely decreeing retroactive laws, he acquired unlimited state power and appointed himself "chief justice" [oberster Gerichtsherr] of the German people. With the subjugation of the justice system, Hitler's will became law. This photograph illustrates the general scorn that the Nazi leadership had for the constitutional state. 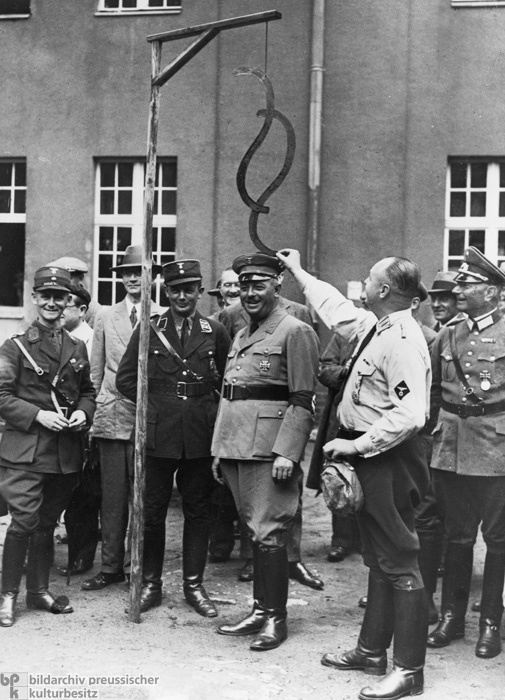 It shows Prussian Minister of Justice Hanns Kerrl (middle) (1887-1941) chuckling as the § (the symbol used to denote German legal articles) is hung from the gallows. Kerrl’s office was also abolished in the wake of the dissolution of the Prussian state parliament on January 30, 1934. A year later, he became Reich Minister of Church Affairs.